Tar paper is an underlayment for asphalt shingles, not a finished roof product. If tar paper is left exposed to the elements for any length of time, it begins deteriorating. If part of your roof is covered with only tar paper and it tears, it needs replacement as a temporary measure until covered it with permanent asphalt shingles. Cut away the parts of the tar paper that are badly torn, wrinkled or damaged, using a sharp utility knife. Nail down the new edges with roofing nails driven through metal disks. These discs function as large washers, distributing the pressure of the roofing nail and decreasing the risk of tearing. Purchase the disks at any hardware or roofing specialty store. Some retailers refer to them as roofing washers while others simply call them metal disks. Loosen the bottom edge of the strip of tar paper that is above the one you are repairing. 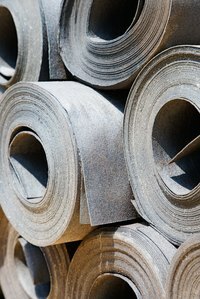 Cut a strip of tar paper from a new roll that is long enough to cover the damaged area with at least 3 feet of overlap on both sides, using a sharp utility knife. Slide the new piece of tar paper up underneath the strip of tar paper that you loosened. The new piece must cover the area where you cut out the damaged tar paper. Run a bead from a tube of roofing tar along the bottom edge of the piece of tar paper that you loosened and underneath the bottom and sides of the new piece of tar paper, using a caulking gun. Press all of the tar paper down against the roof and nail it in place with roofing nails and metal disks.